Cody is a percussionist in the Gustavus Wind Symphony and recently traveled with the GWO on their international tour of Scandanavia. Tech-savvy and friendly face around campus, Cody Horman is a junior computer science major who has, and continues to, contribute to the Gustavus campus and community in enormous ways. Cody is a percussionist in the Gustavus Wind Symphony and loves being in the ensemble, playing music with the intent to make people happy. “I’ve been playing music since middle school and ever since then, I’ve always enjoyed performing for people. I’m a goofy person a lot of the times when I play music and I see people enjoy it,” Cody said. Performing music gives Cody the satisfaction of knowing he’s making others smile. Cody toured this January with the Gustavus Wind Orchestra on their international tour of Sweden and Norway. Fellow percussionist, Sophomore Jonathan Hickox-Young, notes Cody’s impact on the tour. “Cody has the ability to lighten up a room with just his presence and make even a painfully long bus ride interesting and fun. I am so happy to have met a person as kind and genuine as Cody,” Hickox-Young said. Another passion of Cody’s is technology, specifically figuring out how to build and assemble machines. “With technology, I’ve always been fascinated by it. I’ve built many computers, some on my free time and most at my job. I enjoy learning about how they work and how they can connect everyone together online,” Cody said. He is interested in the idea that the world can connect through technology and the potential it has for the future. “I think being able to connect to someone across the world through the internet is a cool idea and it keeps me interested in what we can do with it,” Cody said. One of Cody’s close friends, Senior Thomas Charlton-Jones, first met Cody through their Dungeons and Dragons group. Charlton-Jones loves to have Cody as a friend due to his positivity and friendliness he exudes on campus. “[Cody] is genuine, friendly, outgoing and reliable. I think one of the things that sets him apart is how friendly and outgoing he is, whenever I hang out with him he has multiple people come up to him and talk to him. “In fact my friend group jokes that he knows everybody due to how often he sees and interacts with other people he knows,” Charlton-Jones said. He also is appreciative of the fact that Cody not only knows many students, but takes his time to genuinely get to know his peers. “Also if he sees someone he knows he makes sure to take the time to interact with them and see how they are doing,” Charlton-Jones said. Cody is a junior computer science major and a friendly fellow on campus. A professor of music education and someone who has worked with Cody closely, Heidi Johanna Miller, recognizes Cody’s ability to make a positive impact and his genuineness. “Cody is a great Gustie because he is one of the most enthusiastic and genuine people that I know. He loves what he does, and he has a huge personality that is warm and kind. If he is absent from rehearsal, it is obvious not only because his part is missing, but because his personality is also absent,” Miller said. She also appreciates his willingness to help and all of the qualities that make him unique. “He also helped me figure out what was wrong with my computer when it crashed last fall. One of the unique things about Cody is his love of the sleigh bells. If a piece of music has a part for sleigh bells, no one else is even allowed to consider playing the part. It is automatically Cody’s,” Miller said. “Cody is reliable, cheerful, and a great person to have around. He is an excellent choice for recognition,” Miller said. Cody is seen by his friends, faculty, and employers as a positive force in everything he does on campus. Brianne Twaddle, Office Coordinator Technology Support in Gustavus Technology Services (GTS), has supervised Cody during his years at GTS. “We are so proud to call him one of our student employees,” Twaddle said. Besides reiterating the fact that Cody is one of the friendliest people you will ever meet, Twaddle calls Cody, “the human representation of that ‘Gustavus Community’ feeling that everyone gets when they step on to campus”. 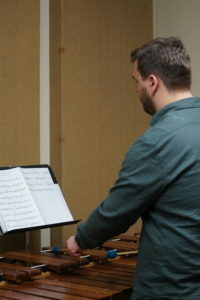 Whether it is in the classroom or percussion studio, Cody “marches to the beat of his own drum (percussion pun intended). He’s not afraid to show his style; whether with his superman socks or his glitterized beard. Also, you should definitely ask him to show you his one-hand clapping skills” Twaddle said.